Brazil’s TAM is aiming to launch services in 2016 to Johannesburg, making it only the sixth airline with long haul or transoceanic flights solely within the Southern Hemisphere. TAM will compete with current codeshare partner South African Airways (SAA) on the Sao Paulo-Johannesburg route. The new TAM service will be the first oneworld link between South America and Africa, plugging a hole in the alliance’s round the world offering. Qantas now links Australia with South Africa and South America while TAM sister carrier LAN also operates over the South Pacific. Star will also be able to offer a round the world product completely in the Southern Hemisphere from Dec-2015, when Air New Zealand launches services to South America. Star member SAA is now the only carrier linking South Africa to South America, also serving Australia. TAM parent LATAM announced on 16-Oct-2015 that it is seeking regulatory approvals to launch flights from its Sao Paulo hub to Johannesburg in 2016. Sao Paulo-Johannesburg is one of several new international routes planned for LATAM as the group reduces its reliance on the challenging Brazilian domestic market. LATAM was established in 2012 following the merger of LAN and TAM and all seven passenger airlines in the group are now in the process of adopting the LATAM brand. Johannesburg will be LATAM’s first destination in Africa and become the first African destination for a Latin American carrier in more than a decade. Since early 2013 TAM rival Gol has been looking to enter the African market with a flight from Recife in northeast Brazil to Lagos in Nigeria using its all-737 fleet. But Gol’s African project seems to have been put on the backburner as it focuses on less risky international expansion within Latin America and the Caribbean. 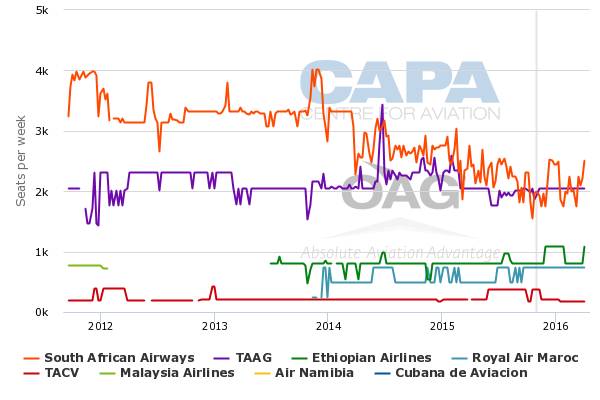 Currently SAA and Angola’s TAAG are the only airlines linking Latin America with the southern portion of Africa (below the equator). SAA currently serves Sao Paulo with eight weekly flights using a mix of A330s and A340s while TAAG serves Sao Paulo with four weekly 777 flights and Rio de Janeiro with three weekly 777 flights. In Africa Ethiopian, Royal Air Maroc (RAM) and Cape Verde’s TACV also serve Brazil but these flights are not entirely in the Southern Hemisphere as their respective bases are north of the equator. RAM serves Sao Paulo with three weekly 767 flights from its base in Casablanca in northern Africa while TACV uses its all-narrowbody fleet to operate one weekly flight to Fortaleza and one weekly flight to Recife from the West African island of Sal. Ethiopian currently operates three weekly non-stop flights from its Addis Ababa hub in East Africa using 787s. Ethiopian initially launched service to Brazil in 2013 via Lome in Togo, where its affiliate ASKY has a hub, but the stop in West Africa was eliminated in Apr-2015. SAA dropped Buenos Aires in Mar-2014 as part of its more recent network restructuring initiative. The suspension of Buenos Aires, which was served with three weekly flights, resulted in about a 20% reduction in SAA’s capacity to South America. 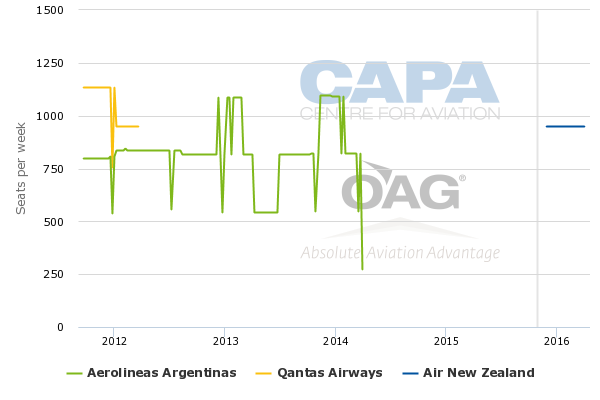 Both the MAS and SAA routes to Argentina were highly unprofitable. Brazil-Africa is a much larger market than Argentina-Africa and Brazil is also a much larger market for connections to Asia. Argentina also lost its only links across the South Pacific when Qantas dropped Buenos Aires in Mar-2012 and with Aerolineas Argentinas dropping Sydney in Apr-2014. But Argentina will regain a South Pacific link on 1-Dec-2015, when Air New Zealand launches a thrice weekly 777 service from Auckland to Buenos Aires. With the new Auckland-Buenos Aires route, Air NZ will become the fifth airline with a long haul or transoceanic route within the Southern Hemisphere, joining LAN, Qantas, SAA and TAAG. TAM will therefore be the sixth airline with such a route, pending regulatory approvals for the proposed Sao Paulo-Johannesburg service. Based on schedules for early Dec-2015 Qantas has the most capacity on transoceanic routes within the Southern Hemisphere, slightly ahead of SAA. The New Zealand-Argentina market is extremely small but Air NZ plans to rely heavily on connections to Australia, where it serves eight destinations. Australia-Argentina is a larger market and is currently served with limited and relatively expensive one-stop options. New Zealand already has a link to South America with LAN’s service from Chile. LAN currently operates a daily 787 flight from its Santiago hub to Sydney via Auckland. LAN codeshare and oneworld alliance partner Qantas currently operates five weekly non-stop 747-400 flights on the Sydney-Santiago route, which it launched when dropping Sydney-Buenos Aires in Mar-2012. Qantas also operates across the south Indian Ocean from Sydney to Johannesburg, which is currently served with between six and seven weekly 747-400 flights. SAA is the only other airline operating non-stops between Australia and Africa with its daily A340 flight to Perth. Virgin Australia, which currently codeshares with SAA in the Australia-South Africa market, dropped its own services to Johannesburg from Melbourne in 2010. With the new Air NZ flight to Buenos Aires and the planned TAM flight to Johannesburg, both oneworld and Star will be able to offer passengers round the world options entirely in the Southern Hemisphere. Round the world fares are an important product for the global alliances but are currently only available to Southern Hemisphere customers with connections that head north and back south. While in many cases round the world customers from the Southern Hemisphere would like to include a stop above the equator they will for the first time gain an option of a shorter routing entirely within the Southern Hemisphere. For Star, an entirely Southern Hemisphere itinerary will become available when Air NZ begins operating from New Zealand to Argentina. Turkish Airlines currently operates from Buenos Aires to Sao Paulo, while Star passengers can also travel around South America using Avianca. From Sao Paulo to Johannesburg and from Johannesburg to Perth flights are available on SAA. Air NZ operates from Perth to Auckland. A major weakness of the Star offering is the lack of domestic flights within Australia, which precludes a passenger from starting their journey in Sydney unless they are willing to travel between Sydney and South Africa via Auckland. oneworld has domestic Australian connections covered with Qantas and also has a stronger network within South America with LATAM. Star has South African Airways for domestic and regional connections in southern Africa but oneworld also has this covered with British Airways South African franchise partner Comair. With oneworld, an entirely Southern Hemisphere round the world itinerary will become available once TAM launches Sao Paulo-Johannesburg. Johannesburg-Sydney and Sydney-Santiago non-stops are available on Qantas. Passengers wishing also to stop in Auckland can opt for LAN’s Sydney-Auckland-Santiago service. From Santiago connections are available on LAN and TAM to Sao Paulo as well as intermediary destinations throughout South America. Round the world fares are not always the most economical option but in many cases they are significantly less expensive than other packages. Given the high fares generally seen across the limited number of southern oceanic routes the option of a round the world global alliance ticket for travel entirely within the Southern Hemisphere will be appealing. TAM has been codesharing with SAA on the Sao Paulo-Johannesburg route and services beyond their respective hubs since Aug-2013. The two carriers have maintained the codeshare despite TAM’s switch from Star to oneworld in Mar-2014, which resulted in TAM ending most of its relationships with Star members. It is unclear if the TAM-SAA codeshare will be maintained as TAM also enters the Sao Paulo-Johannesburg route. TAM could potentially rely on Comair for domestic and regional connections beyond Johannesburg that are now part of the SAA codeshare. TAM could also work with Cathay Pacific on connections beyond Johannesburg to Hong Kong and North Asia. TAM and LAN now mainly offer offline access to Asia via Europe. TAM is clearly familiar with the Sao Paulo-Johannesburg market having been selling seats on the SAA-operated flights. It likely sees an opportunity to enter what at least for now is a profitable market – although there is always a risk the entrance of a second competitor will lead to overcapacity and pressure yields. oneworld would also obviously encourage TAM to serve the Sao Paulo-Johannesburg route with its own metal as it would significantly improve the alliance’s round the world offering. Making the very long haul routes within the Southern Hemisphere successful is not easy. Air NZ and TAM will have challenges. But there are opportunities within the Southern Hemisphere for growth and sufficiently high yields, particularly with the right connections and partnerships.